Tingling air, heavenly petrichor, and freshness permeates the air as it rained heavily early morning. The rain is very welcome and was much awaited. It will replenish the springs, it will nourish the winter crops, benefit the fruit trees and it will improve the weather. The temperature has dropped visibly. People in the streets are bundled up in layers and layers of clothes. 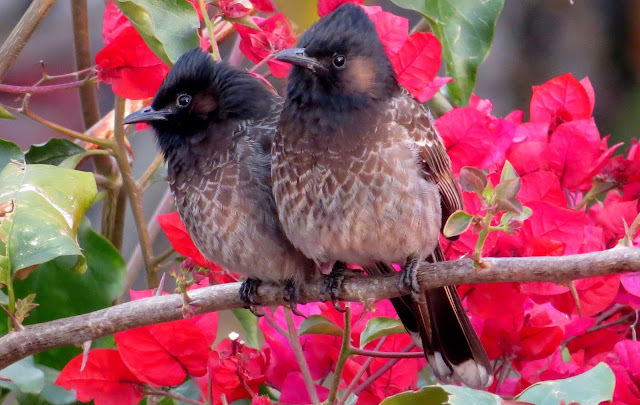 Birds are huddled up together in branches. Monkeys are also cuddled up in groups. We spotted a pair of Red Vent Bulbuls in bougainvillea bush. On cold days, afternoon tea is eagerly awaited for. 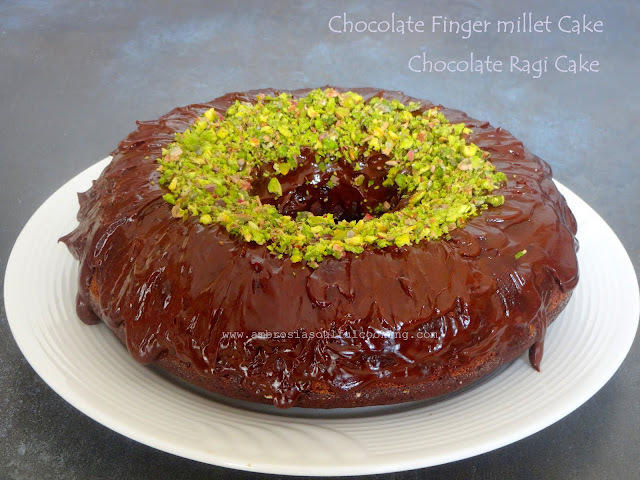 While the teapot hissed and steamed, we dressed up our finger millet cake with thick ganache. 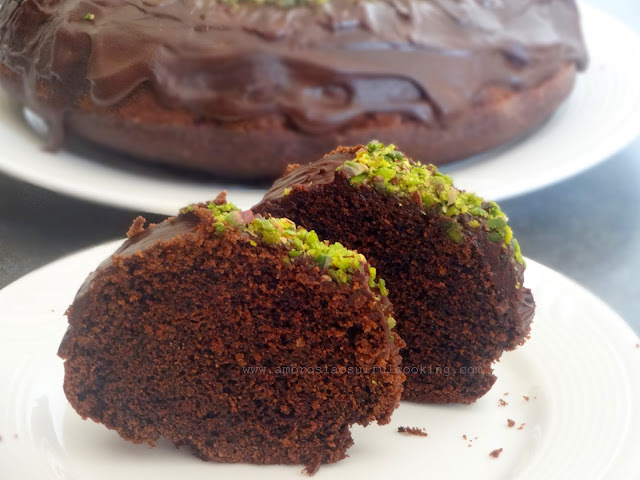 A handful of crushed pistachios were showered on the ganache as it dripped from the sides. The cake we delicious. I baked this cake on lines of Cake Pan Cake or, the Wartime Cake. It is vegan and guilt-free. We bake this cake quite often. When we bake it as a snack cake, we bake with whole grain flour. 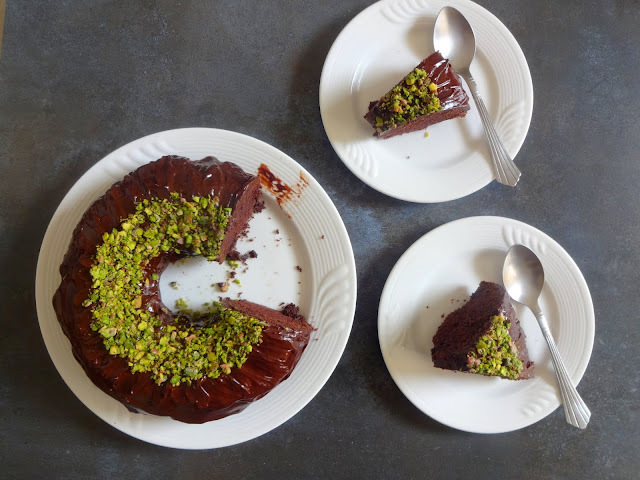 when baked as a dessert cake, its 50% all-purose flour and 50% wholegrain flour. 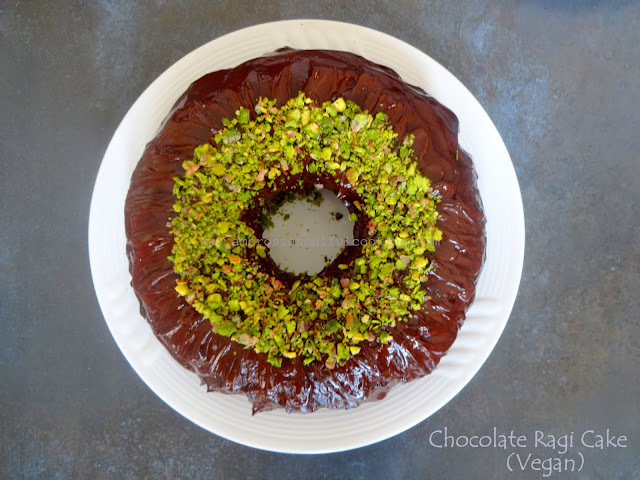 It is definitely an easy dessert cake on the go and is really delish. Generously grease one 8 cup bundt pan with oil. Dust with flour. Tap to remove excess flour. You may bake this cake in two 8 inch round cake pans or one large 9 inches round cake pan. Take all the dry ingredients (first six ingredients) in a large bowl. Add water, oil, vinegar, and vanilla extract. Mix well to get a lump free batter. Remove the pan from the oven after 10 minutes. Let the cake cool completely on a wire rack. I suggest that once the cake cools completely, wrap in a cling film and keep it overnight. Slice next day. It becomes soft, moist and the flavours also come out fully. Note – If you are using a bundt pan, ensure that it is a non- stick material. Grease it well with oil and dust with flour in all the corners and crevices. After you remove the cake from the oven, wrap a towel around the base and sides of the pan for 15 minutes. Use the back of a spoon to push the cake from the sides. If you see that it has left the pan, invert on the rack.